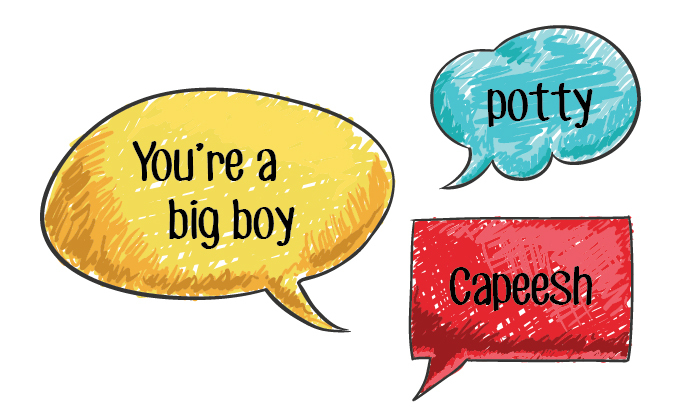 Adult conversation can be tough in its own right, but when you’re used to talking to toddlers and young kids, there are some phrases that you don’t want to let slip out. Certain things you say multiple times a day at home do not mix with other adults. It’s up to adults whether they want to say “please” or “thank you.” They do not appreciate it when another adult reminds them to follow proper etiquette. In the adult world, it’s called a restroom or a bathroom. It is not a potty. Along those same lines, it is not appropriate to ask another adult which kind of potty they went, whether they wiped or washed their hands. Phrases that start with “Here’s the deal” and end with “Capeesh?” make sure toddlers are listening and you’re on the same page. They do not work well with friends or coworkers. To tell you the truth, this is actually a good lesson for many adults, but that doesn’t mean we get to remind them of that. Do you want to sit in timeout? If only we could put certain adults in time out! Let’s face it. This is often an empty threat with kids. Of course we’re going to tell them again to brush their teeth, do their homework or go to bed. Adults, however, can see right through it. These words of encouragement don’t have the same effect when talking with a grownup. In fact, they can be taken as exactly the opposite of encouragement. Steer clear of the phrase unless you are, in fact, talking with a big boy or girl.